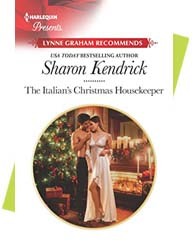 to Sharon Kendrick's site, where you can learn about what a disorganised person she is, her love of Shakespeare, of looking at the sky and how her books subsume her when she's in the middle of writing one! You can buy her books, see what writing-related adventures she'll be going on — plus you can browse through her blog. She loves to hear from her readers — so do please make yourself known! From making the billionaire's bed...to Christmas between his sheets!